What is a Beer Sommelier? Here’s your cheat sheet for Ticketybrew’s Houblen Dobbelen IPA Tripel. Featured in BeerBods Plus box 4 on 29 March 2018. Be careful with the carbonation on this one – it’s a gusher by all accounts! Find the brewery on Twitter at @TicketyBrew and on Instagram at @ticketybrewers. I’ve seen suggestions as low as 4° to 7° C but personally I reckon something around 10°C should be better for this beer as you’ll want to get the full complexity of the flavours in this one; about an hour in the fridge should do it. As ever, be wary of over-chilling your beer. More chill means less flavour. Here’s my post on recommended serving temperatures. A hoppy Tripel? An ester-laden IPA? It’s hard to tell in advance how this one’s going to turn out. Luckily, this isn’t the only Houblen Dobbelen IPA Tripel out there. Brasserie d’Achouffe do one too, which is described as having a big malty body, distinct dryness, and expressive estery fruitiness. Sounds great! We can also look back to Cali-Belgique by Stone Brewing for guidance on how this IPA/Belgian mash-up might work. I should expect some sweetness in there balanced by a drying finish with peppery notes from the yeast and fruity hop characters. Some online reviews mention smoky malt notes too, which could be interesting. For this beer you’ll most likely want something with a similar intensity of flavour. Tripels are great with basil, apparently. And also with shellfish, which in turn are also great with basil… spicy Thai basil clams, perhaps? Or spaghetti alle vongole. I feel like I’ve been suggesting a lot of seafood lately, so let’s head back towards the basil and think perhaps about a really fresh tomato-mozarella-basil pizza with some chilli oil to match the intensity of the beer. It depends how hoppy this is though – sometimes hop acids can increase the heat of spices. In which case perhaps aim for some honey-glazed ham instead, which should match up very nicely with both side of the slightly Jekyll and Hyde sounding beer. Read more on this beer from BeerBods. 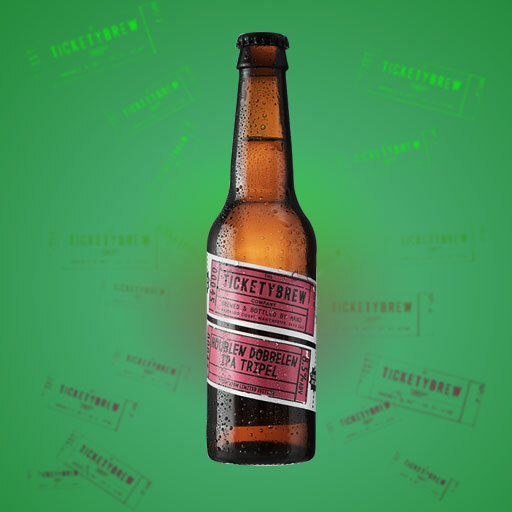 There’s not much about this beer on Ticketybrew’s website unfortunately. Seen something on my site that interests you? Get in touch and let's talk about it some more. If you like what I do here, show your support with a one-off donation for the price of a swift half. © Copyright 2017–2019. All Rights Reserved.